Scientists are now using the microorganism yeast to make more than bread these days. They’re genetically engineering it to create the cannabis plant’s active compounds, cannabinoids. Through a fermentation process similar to brewing beer, companies like the Canadian-based Hyasynth proved that biotechnology could produce cannabinoids without the plant. This process could prove invaluable to the cannabis industry because these compounds can be engineered and extracted at scale for a broad range of medical uses. Hyasynth specifically re-created the cannabinoid cannabigerol (CBG) and advised that it could pioneer the way to other minor and major cannabinoids. While many argue that the efficacy of cannabis as a treatment for illness and disease needs further evaluation, more and more studies prove that the plant definitely helps people like those with seizures or symptoms of nausea when all other medical options failed. Other scientists work feverishly to produce similar results. German biochemists published a study in the journal, Biotechnology Letters, describing their success in engineering THC using similar methods. The Canadian company, Anandia Labs is close to creating its own cannabinoids using yeast. Physicians like Dr. Jeffrey Hergenrather, one of the first doctors in the U.S. licensed to treat people with cannabis, illustrates cannabis’s curative properties through his research and patient treatments. The ability to create medicinal products from the genetically engineered yeast without greenhouses full of plants increases the scale of the development of medicinal products and paves the way for innovations in the cannabis industry. Producing large quantities of cannabis compounds also supplies researchers with more material to test the chemicals to learn more about their effects and properties and provides the possibility of creating new cures through research. While CBD has its own medicinal properties, it can be converted into additional cannabinoids like tetrahydrocannabinol (THC) that also help relieve symptoms like nausea and pain. 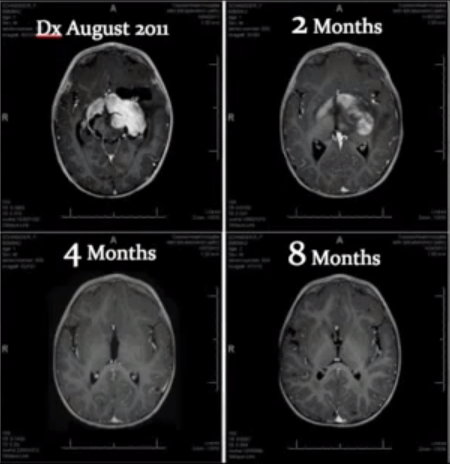 Dr. William Courtney produced further evidence of the positive merits of cannabis with an 8-month-old baby that had an inoperable brain tumor. After being treated with cannabis oil, the tumor’s size diminished significantly,and the child has no lasting long-term effects that treatments like chemotherapy can leave you with. The process involves inserting cannabis genes into the yeast genome. There the genes produce enzymes that create cannabinoids. Cannabis is unique from other plants because of this ability. Medical benefits and potency of specific cannabinoids are attributed to a genetically encoded switch or single enzyme that is the last step in the cannabinoid path. These switches include CBDA synthase and THCA synthase which transform cannabigerolic acid or precursor molecules into either CBDA or THCA. Plants that express hyperactive THCA synthase produce elevated levels of THC and plants coded for CBDA synthase produce higher amounts of CBD. Before inserting the cannabis genes, the metabolic systems of the yeast are engineered so that it produces the desired molecules. Kevin Chen of Hyasynth says that using yeast to grow cannabinoids is more efficient than the process used for artificial chemical synthesis. This is a reference to the THC pills currently on the market used for nausea and improving appetite in AIDS and cancer patients. While there is no statistical data supporting it, some suggest the yeast method may have lower production costs than other methods currently used. There is also more consistency in the results than in cannabis plants. Other factors like how much water and light a plant receives during the cultivation process produce vast differences in the end product. Still, plants remain some of the least expensive chemical production systems in the world and plants seem to be more efficient than yeast.